Posted February 24, 2013 by grohling & filed under Archive, BCS Oxfordshire. The visit to ECMWF was scheduled to start with a short introduction about ECMWF, the Computer infrastructure used at ECMWF and a guided tour to the computer hall where all the supercomputers used by ECMWF reside. Manfred Kloeppel started by introducing ECMWF as an independent intergovernmental organisation currently consisting of 37 Member and Co-Operating states. Established in 1975, ECMWF’s original goal defined by a Convention is to provide medium-range weather forecast to member and co-operating states twice daily and up to 10 days ahead. Each day, more than 300 million observational data elements are collected round the clock by a variety of Earth observing systems, including satellites, automatic and manned stations, aircrafts, ships, weather balloons and buoys. The production of a medium-range weather forecast (up to 15 days ahead) consists of four key requirements: a state-of-the-art data assimilation and analysis system, sophisticated weather prediction models, a constantly updated database of global weather observations and ultra-powerful computers. ECMWF is not known to the general public because their key customers are the government’s environment department such as the Met Offices of Member and Co-Operating states. 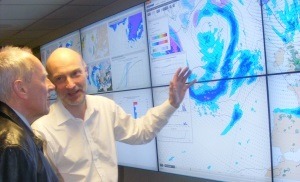 ECMWF will typically provide the numerical forecast data to the UK Met Office (or equivalent of the Member or Co-Operating states) and the UK Met Office will apply their weather forecast model to ECMWF’s data and then disseminate the results to the general public via news weather reports, Met Office website etc. Some Member or Co-Operating states do not have their own weather forecast model so they will then just circulate ECMWF’s numerical forecast in their appropriate medium. Isabella Weger, Head of Computer Division spoke into detail about the need for high compute power to process complex data algorithms being applied to 300 million varieties of data from different sources to come up with the 15-day medium-range forecast. ECMWF’s High Performance Computing Facility (HCPF) currently consists of two identical IBM Supercomputer 1600 clusters. Each one is based on 272 IBM pSeries p6-575 compute servers interconnected by a low latency high-speed network. The HPCFs have a ~17,400 total number of processes, 330 TFlops Peak Performance and a Sustained performance of ~20TFlops. ECMWF’s forecast products are disseminated over Regional Meteorological Data Communications Network (RMDCN). The main aim is to provide a network infrastructure for both the connections between ECMWF and its Member and Co-Operating States. The Supercomputers have a 50% resource allocation to Research, 25% for Operational forecasts and another 25% allocated to Member States for any activities they wish to perform.